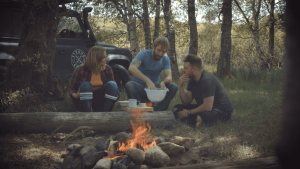 All good things must come to an end and our epic journey with Katie and Marcus is alas, coming to a close with Pit Stop, the fourth and final installment of this season’s Adventure of a Food Truck series. 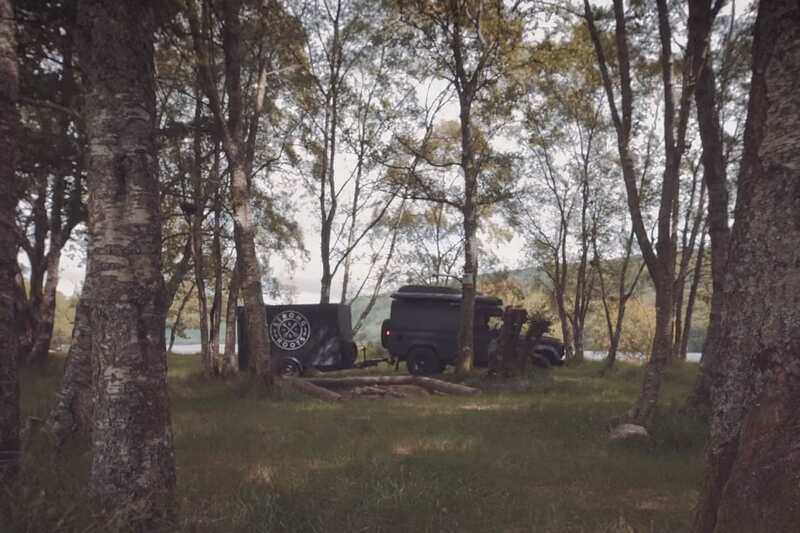 For their last food adventure, they’ve ventured into the woodlands, set up camp and gathered round a crackling fire, cooking up a plate of barbequed Kale & Quinoa Burgers in pitta, served with a delicious foraged salad. After a quick glimpse of Marcus showering au naturale, they begin setting up camp beside the lake. From a distance, Katie spots a man paddling his way to shore, who turns out to be Patrick from Firehouse Bakery. Patrick paddled his way to the campsite so as to show the pair how to make spelt and honey pittas from scratch. They gather round the campfire as Patrick shows them how to mix the dough together. In between the mixing, they explore their surroundings, swinging from trees, clambering across rocks and skimming pebbles. Once mixed, they roll out the dough and place them on a hot pizza stone, keeping a watchful gaze as the dough rises. With the job done Patrick hops back in his canoe and returns home. Next on the menu, a wild foraged salad. Stepping into nature’s supermarket, Marcus picks wild garlic, fennel, and dandelion. Not one to shy from an adventure, Marcus ominously declares that they should hunt each other through a game of paintball! Decked out in camouflage the pair chase each other through the woods, personifying modern day hunter-gatherers. 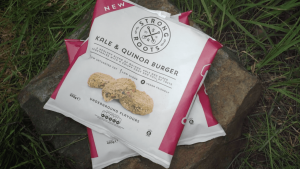 As the night draws in, Marcus and Katie start making their campfire meal, putting the Kale & Quinoa Burgers on the barbeque with roasted vegetables. 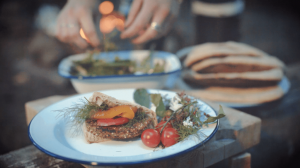 Once cooked they place the burgers in the pitta bread and serve the wild foraged salad on the side. After devouring the meal, Katie catches Marcus roaming the forest looking for signal. They both hear a mysterious rustle in the forest. Terrified, they run into the night with Marcus screaming “I’m too young and beautiful to die!”…. a perfect, dramatic ending to this season’s Adventure of a Food Truck series. To watch their food journey from start to finish, follow our YouTube channel: http://bit.ly/StrongRootsYT. 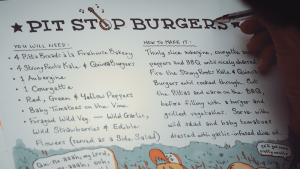 And if you want to make Pit Stop Burgers follow the recipe below! Thinly slice the aubergines, courgette, and peppers and BBQ until nicely charred. Fire the Kale & Quinoa Burgers until cooked through. Cut the pittas and warm on the BBQ, before filling with a burger and grilled vegetables. Serve with wild salad and baby tomatoes dressed with garlic-infused olive oil.